I like my key lime pie very tart, so I decided to add a little True Lime to a traditional key lime pie from Epicurious. I think the True Lime really did add some extra zing. Preheat oven to 350 degrees F. Grease a 9 inch pie plate. Stir together graham cracker crumbs, crushed almonds, sugar, and butter in a bowl, then dump mixture into pie plate and press into the bottom and slightly up sides. Bake crust in middle of oven 10 minutes and cool in pie plate on a rack. Leave oven on. Make filling. In a mixing bowl, stir together condensed milk and egg yolks. Stir in lime powder, followed by juice. Pour filling into crust, Lay a sheet of foil loosely over top and bake for 15 minutes. Cool pie completely on rack (filling will set as it cools), then chill, covered for 8 hours. Whip cream into soft peaks. Add sugar to taste and pipe along edge of pie. Decorate with sliced key limes if you have some extras. Sure, Georgina. Thanks for asking! can i use ur picture? 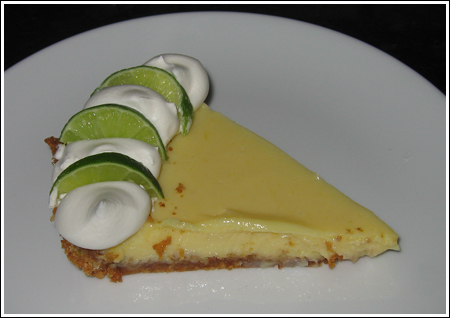 I love a good, tart key lime pie too … too often I have it and it’s creamy and mellow. I’ll have to keep and eye out for True Lime (I usually just make the custard and serve it in rammekins instead of the whole crust thing). A whole can of regular Eagle brand has 30 grams of fat. 4 egg yolks have 20. The filling alone has 50 grams of fat, so divide that by 8 and you know there are at least 6 grams of fat in 1/8 of the filling. 1/8 of the crust has at least 6 grams, so this is not a low calorie pie. If you wanted to, you could use reduced fat Eagle brand and use a prepared reduced fat crust. OR, you could just sprinkle some graham cracker crumbs across the bottom of the plate and pour the filling over. I wouldn’t bother with fat free Eagle Brand because the texture would be off. Another alternative is to try Kraftfoods. This pie looks pretty good, though you might want to use a combo of lite and fat free cream cheese rather than all fat free. And then of course, you could throw in some True Lime to make it spikier ;). True Lime has a recipe on their web site you might like. It’s not real key lime pie, but it might give you the flavors you are craving. You could make it as directed below, but use sugar free vanilla pudding and lite Cool Whip. 1. Pour milk into large bowl. Add pudding mix and True Lime. Wow, I re-read this and it sounds like I work for True Lime/True Lemon. Trust me, I don’t. I just get excited about new products. Key Lime Pie is one of our favorites! And yes, we like it on the sour side. Happy New Year, Anna! The pie really is good if you like your pie a little sour. I found True Lemon and True Lime in the spice aisle. Belated Happy Holidays to you and your family! I have been enjoying the many recipes you have posted during the season. Thanks! This Key Lime pie looks goooood! Where do you find the powdered Real Lime?